The latest issue of Dujour Magazine, the Virgin Issue, is officially out now! I've been very busy these past few weeks searching for pretty products, tracking new trends, creating mood boards, and noting runway collections. It makes me very happy to see the finished product created by all the amazing girls at Dujour. 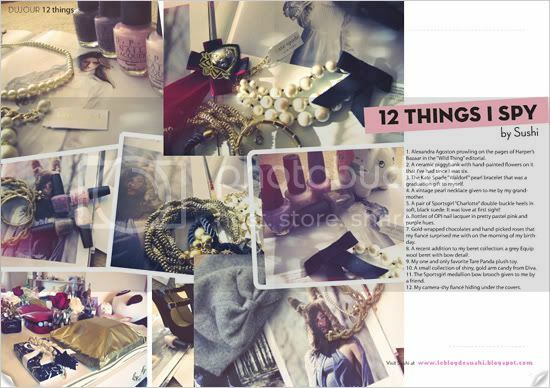 Below is a peek at some of the pages I contributed to in this issue. If you're interested in reading the entire issue, Dujour Magazine offers a one year digital subscription for USD $12.00, or you can purchase a print copy for USD $26.00 each. Please visit the Dujour website to subscribe! P.S. 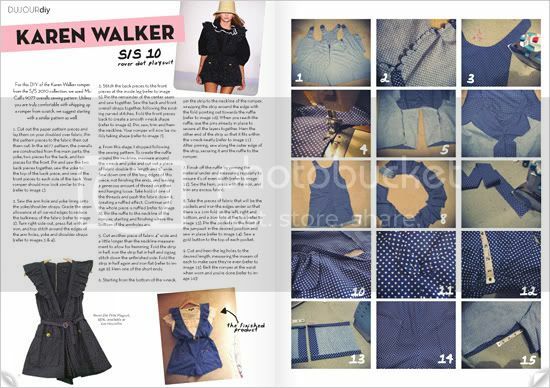 Also, I will be posting a step-by-step DIY of the Karen Walker playsuit very soon. This looks absolutely fantastic! The Karen Walker playsuit DIY looks really interesting. Wow, what a great and pretty magazine! I love all the inspiring pieces in it. Very romantic and summery. It looks so good, you must be very proud! I love the styling and the look and feel and cohesiveness of all the pages. Ohhh I love this!! Love what you did!! I didn't knew it was there already! I'm totally going to order the print version :) :) I might reblog your pictures in the meantime if thats okay? As someone who owns the KW playsuit, although I understand that DIYs are an affordable option if you can't afford the real thing, I can't help but feel slightly ripped off now. Anonymous - I would have loved to have bought the KW playsuit myself but couldn't afford it. The DIY was a fun quick fix, but definitely doesn't match the quality or design of the real thing. this magazine looks amazing!! i can understand how good it feels to finally hold or see your final work! i am a graphic designer myself, and would love to branch out and do more projects (im inhouse). Where can i pick up a copy?